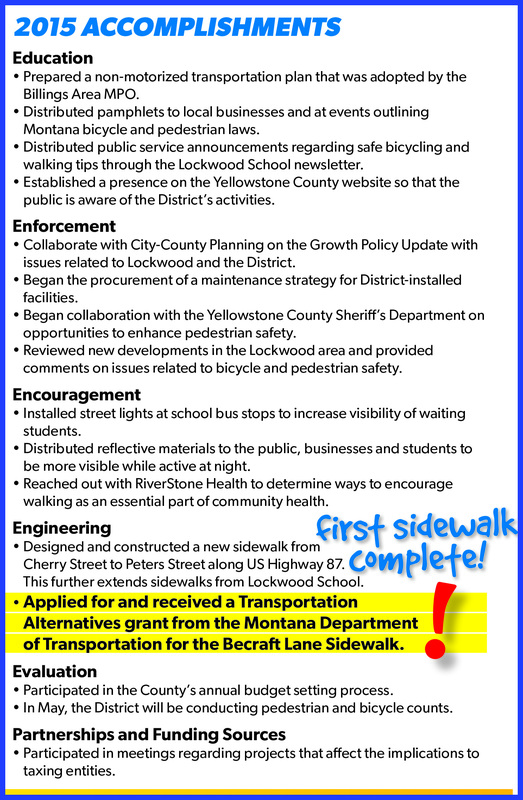 The Lockwood Pedestrian Safety District is a Special Improvement District that was created by Yellowstone County from a 2014 referendum where voters living within the Lockwood School District voted 61% to 39% in favor to create the District. The purpose of the District is to enhance pedestrian safety and provide for alternative means of traffic transportation in the (unincorporated) Lockwood area. The Lockwood Pedestrian Safety District serves over 7,750 people that live within the Lockwood Census Tract 8 area. The District will focus to construct and maintain improvements to enhance pedestrian safety and provide for alternative means of non motorized transportation in the area. The District is allowed to be funded with up to 10 mills, which is an estimated annual revenue of $212,697. 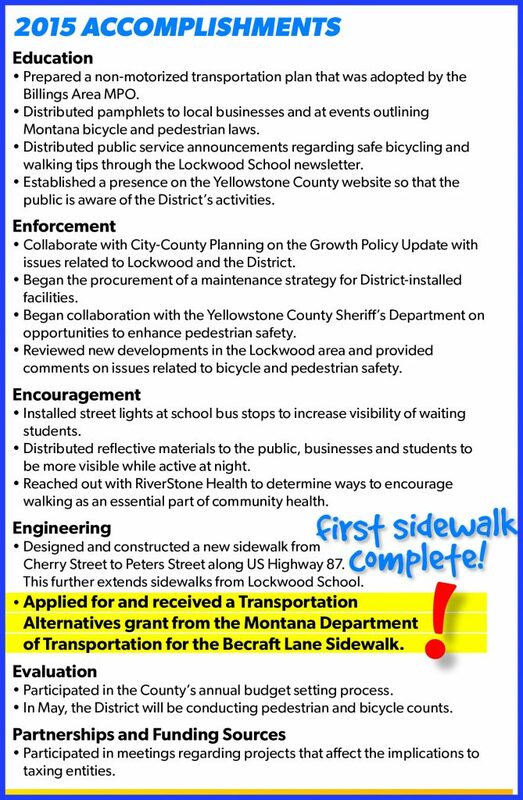 Administration of the Lockwood Pedestrian Safety District is under the jurisdiction of the Yellowstone County Board of County Commissioners who receive input and recommendations from the Lockwood Pedestrian Safety District Advisory Board which consist of 10 Board members. The Lockwood Pedestrian Safety Board meets on the first Wednesday of each month at 7pm at the Lockwood School Administration Building in the board room. For more information, contact the Yellowstone County Board of County Commissioners at 406-256-2701.